Getting close to exotic animals, like the majestic elephant, is a dream shared by travelers all over the world. Many of us love animals deeply and would give anything to be near these beautiful creatures, but we don’t realize that this scenario normally comes at the cost of the animal’s welfare. How so? In order to get many of these species docile enough to be approached by humans, many times they are mistreated/drugged, since it would otherwise be very difficult to have them comply. This terrible exploitation of animals happens at places like Tiger Kingdom in Chiang Mai, and some of the elephant “sanctuaries” as well. The good news is that it is possible to enjoy elephants in an ethical way in Chiang Mai, as we’ve found a place that truly cares for them! There are plenty of other places that I hadn’t thought to avoid before as well, like zoos or circuses, where animals are housed in really poor and unnatural conditions. Today, I opt to visit only the places that clearly contain the animals in safe environments and truly care for them. In Thailand and other parts of Southeast Asia, elephant exploitation is quite common, as they are forcibly ridden by tourists and obligated to perform different kinds of shows, sometimes even on sidewalks in the streets. I personally wanted to enjoy their presence in Chiang Mai without contributing to their mistreatment in any way, and fortunately, through diligent research, I was able to find just the perfect place to do so. The Elephant Nature Park is one of the most known animal rescue centers in Chiang Mai, and for good reason. 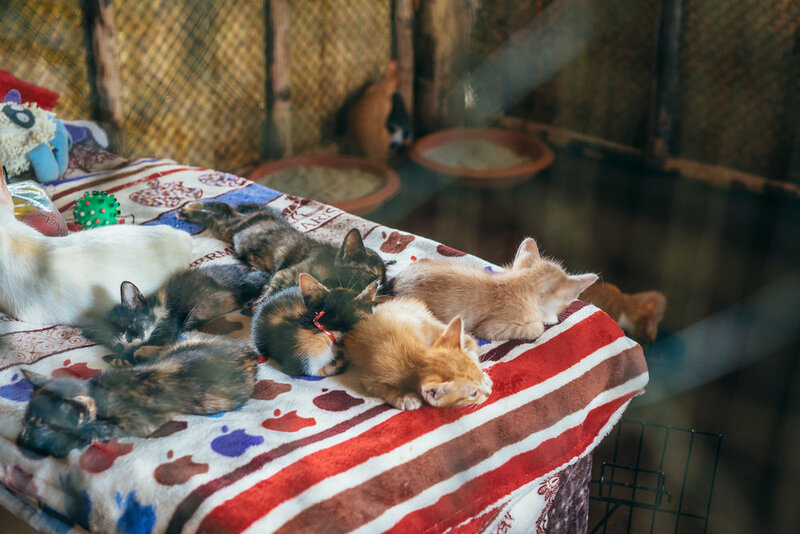 And they don’t just care for rescued elephants, but also different kinds of animals, like dogs, cats, and oxen. It was especially touching to see dogs with disabilities and in wheelchairs being taken care of — being given a chance at a normal life. They count with tons of volunteers that help run the center and help the employees of Elephant Nature Park with the daily tasks. At the time of our visit, they counted with 30 elephants that had been rescues from circus, riding camps, or from the unprotected forest where some of them had been hurt with explosive mines. Here, the elephants are not forced to do anything. You can, respectfully, approach them and pet them, but the elephants will leave whenever they’re done with the nearby food or when they’re bored with you. Overall, learning about and being a part of this beautiful project, even if only for a few hours, has been an unforgettable experience. The price to visit the compound for an entire day is 2,500 baht ($75), which is without a doubt the most expensive activity we’ve taken part in during our 7 months in SEA, yet also one of our most cherished ones. Plus, the money goes towards helping the upkeep of the center and the very food that the elephants eat (they each eat 12-18 hours a day, and 200-600 pounds per day!). One thing we noticed and would be remiss to not mention is, if you do plan on going, make your reservations on their website early, as they tend to sell out quickly (especially during high season)! The day starts at around 8:30 AM, when you’re picked up at your hotel (or apartment, in our case) by a van with some of the other visitors. And obviously, depending on where you are within the route, the time it takes to get to Elephant Nature Park will vary. We were the last ones and the van ride was about an hour and 15 minutes. Then, while you’re in the van, the employees will play entertaining and informative videos that teach you about elephants, their context in Thailand and how they’re mistreated, and safety instructions to follow in the park to not get punted across the plains by one of the elephants. Once you get there, you’ll be assigned a table where you’ll leave your (non-valuable) belongings and where you’ll later have lunch. After setting everything down and paying, the day begins! Once the elephants eat all of the bananas provided, you’ll begin a walking tour that takes you through the park grounds. During the tour, you’ll be able to see where the elephants spend their days, how they’re fed, where they sleep (they only sleep 2-4 hours per day! ), and how the injured ones are cared for. Next, it’s time for a break and lunchtime! Back at the original seating area, there’s an extensive and delicious vegetarian buffet waiting for you — ours was a little bit before 12 PM. In total, you’ve got about an hour and twenty minutes to eat and walk around the premises if you wish (which you should!). This is the perfect time to interact with the rest of the animals; you can visit the dogs or the cat kingdom. While you can visit the cat area on your own, there’s actually a guided tour of the dog area. If that’s something that interests you, ask about it with enough time so that you’re prepared for the timing of the tour. After the break is over, it’s time for everyone’s favorite part: the elephant bath! First, you’ll see how they bathe deep in the river, playfully splashing water everywhere. Then, you get to change into a different set of clothes or a bathing suit so that you can get into the water with them. We didn’t change because in our case we only got into ankle-deep water with them — either way though, you’ll end up getting dirty and it’ll be great. You’ll be provided with a bucket that you’ll use to bathe the elephants while they eat (again!) and bathe themselves, but always at a safe distance. Just before leaving, you’ll have a chance to approach the elephants and take a photo up-close with these beauties — but always at your own caution! The day comes to a close with the van taking you back to the hotel around 3:30 PM, likely having made new friends, both inside and outside the park! We were lucky to have met someone who spent some time volunteering at the Elephant Nature Park for a week, giving us real insight into the work that’s realized there after all of the day-visitors go home. This person essentially corroborated what we had heard previously: that these elephants are safe and cared for. It’s on us to make a difference at the time of choosing how we travel and which experiences we take home. A small gesture such as visiting and contributing towards an ethical, caring place — or even just avoiding those places that exploit certain species of animals — will help further the goal of preventing animal exploitation in the tourism industry. The best, and only, way to end this article is with more pictures of our awesome day at the Elephant Nature Park.